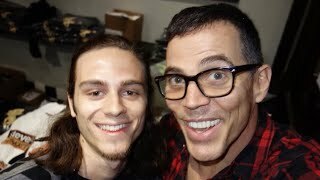 About Steve-O; "The Bucket List"
"YOU UNDERSTAND AND ACKNOWLEDGE THAT THIS SHOW CONTAINS GRAPHIC AND CRUDE SEXUAL HUMOR AND ADULT LANGUAGE, INCLUDING BUT NOT LIMITED TO GRAPHIC DEPICTIONS OF HUMAN ANATOMY, WHICH SOME ATTENDEES MAY CONSIDER PROFANE, VULGAR, OFFENSIVE AND/OR OTHERWISE OBJECTIONABLE. BY USING THIS TICKET OR ATTENDING, OBSERVING OR PARTICIPATING IN THIS SHOW, YOU HEREBY RELEASE, FOREVER DISCHARGE, AND COVENANT NOT TO SUE ANY PERSON OR ENTITY CONNECTED IN ANY WAY WITH THIS SHOW, AND YOU HEREBY WAIVE ANY LEGAL OR EQUITABLE RIGHTS OR REMEDIES YOU HAVE OR MAY HAVE ARISING FROM THE CONTENT AND MATERIAL IN THE SHOW." Must be 21 & up to enter.